Stop searching, "How to make a roblox exploit" on Google. Stop waiting for exploit developers to fix their stuff. In this day and age, anyone can easily create one using our API. You can make exploits using what even some of the biggest exploit creators use. You're given precoded commands. 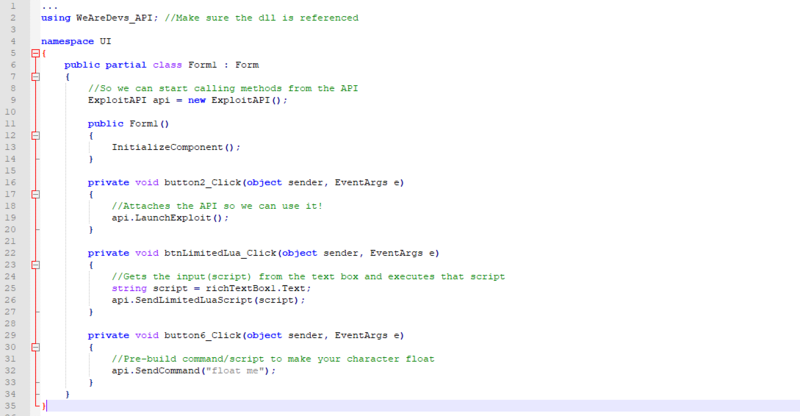 You can create your own custom commands with Lua scripts. You can even give people massive power with a limited Lua executor and a Lua C executor. Go ahead and sell, give it out to friends, make videos, or create something for yourself. Create an exploit in C#. This API has largely grown in capability from when the project was first released. It can execute complicated scripts such as Dex Explorer thanks to instance caching, it can run loadstrings, it has a bypassed HttpGet() which can load content from any website, and adds functions to the Lua environment. Theres very little work you need to do on your end. This leaves you with more time to create quality content!